Two weeks ago I led a tour for Sandy, a triathlete from Israel who was attending a business conference in Florence. I just received some photos from her, which reminded me of the pleasant, vigorous day we spent together riding through Tuscany. Sandy pre-arranged her bike rental and requested a private guide through the local bike store who also sponsors my team. She connected with me while she was still in Israel. I planned an 80k tour for her, based on what I learned of her skills and fitness, and hoped for the best. We clicked well with each other. Being around the same age, and Sandy having lived for some time on the Upper East Side, we had alot to talk about. 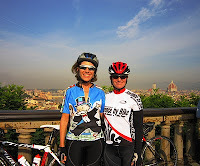 Our riding skills, energy and endurance levels were well synched, and we share a passion for cycling and adventure. That made it all the more fun! This ride ended up being just perfect because we combined some real hard work and climbing with fascinating stops along the way. I pushed her just enough to make her feel like she earned her gelato in Panzano. It is infinitely gratifying to hear the "oohs and aahs" behind me while passing through this historically rich, endlessly changing landscape. Sandy went home happy and we have continued to keep in touch. It was more than just a bike ride because I got to know alot about Sandy in a short amount of time. People are very open and honest when they are on vacation, because they are away from their daily responsibilities, looking at the world in a different way.